On September 25, 1955, forty-three persons banded together in Christian love to organize North Christian Church. Worship services were held at St. Paul’s Episcopal Church from October 1955 until February 1956, when the Caldwell mansion on 25th Street was purchased and converted to a house of worship. In 1958, the church purchased land on Tipton Lane for the construction of a new building. 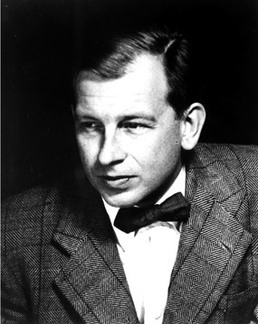 In November, 1958, an Architectural Committee was formed, and they selected Eero Saarinen as the architect in February, 1959. On September 2, 1962 and the congregation held a groundbreaking ceremony. The first worship service in the new church took place on March 8, 1964. Six weeks later on April 19th, the new building was dedicated. 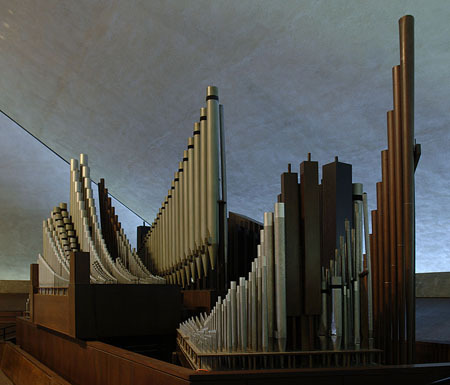 The Holtkamp organ was dedicated the following Sunday. Born to world famous parents, architect and Cranbrook Academy of Art director Eliel Saarinen and textile artist Loja Saarinen, Eero Saarinen was surrounded by design his whole life. It came as no surprise that Eero was helping his father design furniture and fixtures for the Cranbrook campus by the time he was in his teens. In 1929, Eero left for Paris where he studied sculpture before enrolling in the Yale architecture program the following year. In 1934, he returned to the State of Michigan to teach at Cranbrook, work on furniture designs, and practice architecture with his father. The Arch was Saarinen’s first great triumph, but there would be many more. Projects, such as the General Motors Technical Center near Detroit, the TWA Terminal in New York City, and the Dulles International Airport near Washington, D.C. brought him acclaim. He became one of the most accomplished and creative architects of his time. In “Eero Saarinen on His Work” edited by Aline Saarinen, and published by the Yale University Press in 1962, Saarinen writes about designing North Christian Church. Read it here.